make sure to select 'original size' on the image pages, they're all bigger than full screen. We never had images of a comet when my kids were growing up but my grandson will be in kindergarten in the fall. To the young folk,they will be places they see getting explored. Planning for humankind's first mission to a binary asteroid system has entered its next engineering phase. ESA's proposed Hera mission would also be Europe's contribution to an ambitious planetary defence experiment. Named for the Greek goddess of marriage, Hera would fly to the Didymos pair of Near-Earth asteroids: the 780 m-diameter mountain-sized main body is orbited by a 160 m moon, informally called 'Didymoon', about the same size as the Great Pyramid of Giza. 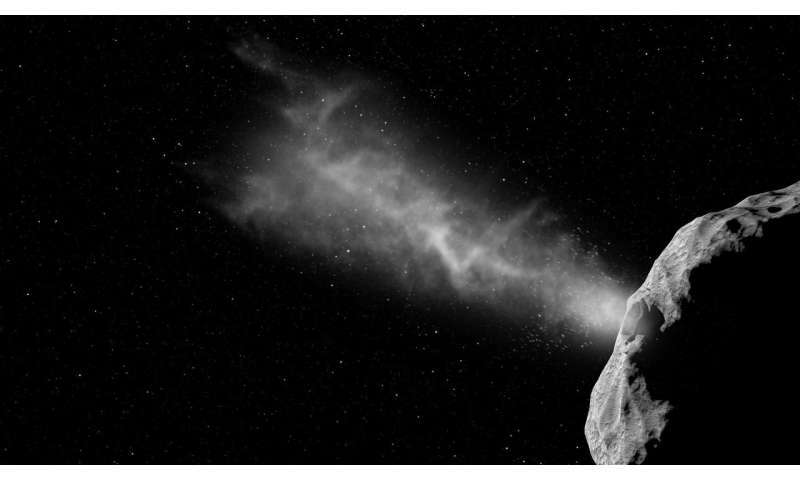 "Such a binary asteroid system is the perfect testbed for a planetary defence experiment but is also an entirely new environment for asteroid investigations. Although binaries make up 15% of all known asteroids, they have never been explored before, and we anticipate many surprises," explains Hera manager Ian Carnelli. "The extremely low-gravity environment also presents new challenges to the guidance and navigation systems. Fortunately we can count on the unique experience of ESA's Rosetta operations team which is an incredible asset for the Hera mission." The smaller Didymoon is Hera's main focus: the spacecraft would perform high-resolution visual, laser and radio science mapping of the moon, which will be the smallest asteroid visited so far, to build detailed maps of its surface and interior structure. By the time Hera reaches Didymos, in 2026, Didymoon will have achieved historic significance: the first object in the Solar System to have its orbit shifted by human effort in a measurable way. A NASA mission called the Double Asteroid Redirection Test, or DART, is due to collide with it in October 2022. The impact will lead to a change in the duration of Didymoon's orbit around the main body. Ground observatories all around the world will view the collision, but from a minimum distance of 11 million km away. "Essential information will be missing following the DART impact – which is where Hera comes in," adds Ian. 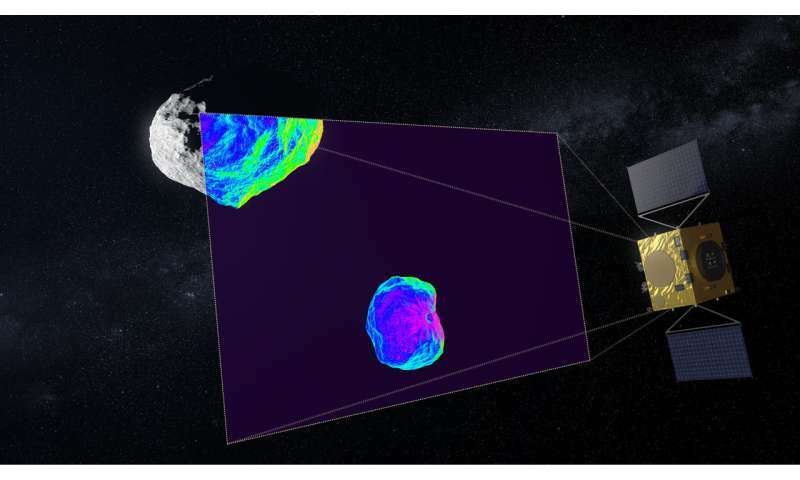 "Hera's close-up survey will give us the mass of Didymoon, the shape of the crater, as well as physical and dynamical properties of Didymoon. "This key data gathered by Hera will turn a grand but one-off experiment into a well-understood planetary defence technique: one that could in principle be repeated if we ever need to stop an incoming asteroid." The traditional method of estimating the mass of a planetary body is to measure its gravitational pull on a spacecraft. That is not workable within the Didymos system: Didymoon's gravitational field would be swamped by that of its larger partner. Instead, Hera imagery will be used to track key landmarks on the surface on the bigger body, 'Didymain', such as boulders or craters. By measuring the 'wobble' Didymoon causes its parent, relative to the common centre of gravity of the overall two-body system, its mass could be determined with an accuracy over 90%. 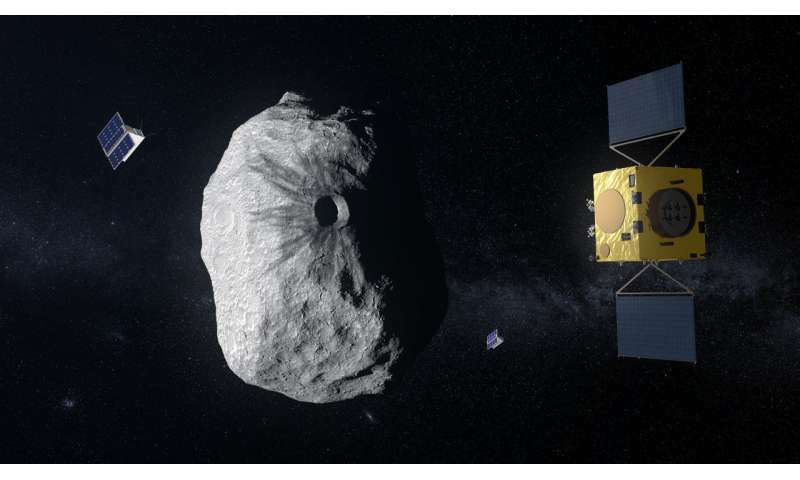 Hera will also measure the crater left by DART to a resolution of 10 cm, accomplished through a series of daring flybys, giving insight into the surface characteristics and internal composition of the asteroid. 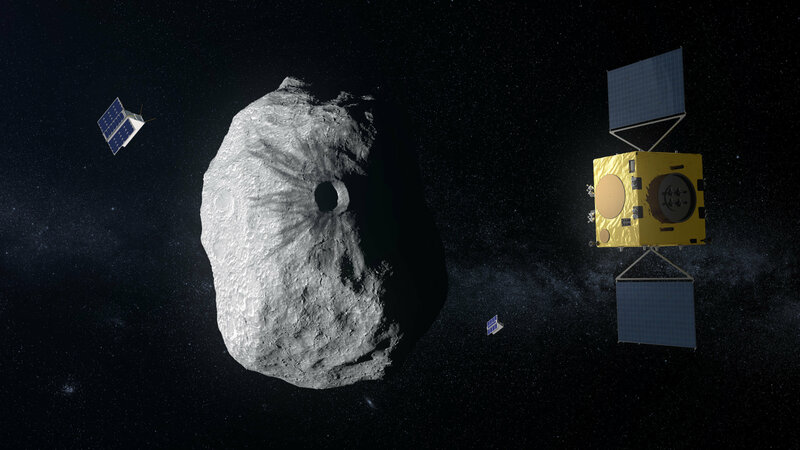 "Hera benefits from more than five years of work put into ESA's former Asteroid Impact Mission," comments Ian. "Its main instrument is a replica of an asteroid imager already flying in space – the Framing Camera used by NASA's Dawn mission as it surveys Ceres, which is provided by the German Aerospace Center, DLR. "It would also carry a 'laser radar' lidar for surface ranging, as well as a hyperspectral imager to characterise surface properties. In addition, Hera will deploy Europe's first deep space CubeSats to gather additional science as well as test advanced multi-spacecraft intersatellite links." NASA's DART mission meanwhile has passed its preliminary design review and is about to enter its 'Phase C' detailed design stage. Hayabusa2 is close to arriving at asteroid Ryugu. After a journey of around 3.2 billion km since launch, our destination is finally near. Two small objects will soon meet in outer space 280 million km from the Earth. Figure 1 shows Ryugu photographed by the ONC-W1 (Optical Navigation Camera - Wide angle) on June 24, at about 15:00 JST. We can see Ryugu floating in the jet black of space. Hayabusa2 is close to arriving at asteroid Ryugu. After a journey of around 3.2 billion km since launch, our destination is finally near. Two small objects will soon meet in outer space 280 million km from the Earth. Figure 1: Asteroid Ryugu images by the ONC-W1. Photograph was taken on June 24, 2018 at around 15:00 JST and shows a section of the camera's wide field of view. Figure 2 shows Ryugu photographed with the ONC-T (Optical Navigation Camera - Telescopic) on June 24, at around 00:01 JST. The appearance of the surface has now become much clearer. The distance between the spacecraft and the asteroid when this photo was taken was about 40 km. 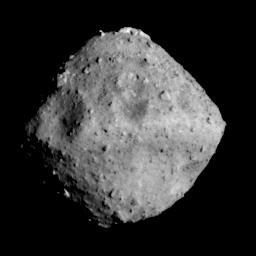 Figure 2: Asteroid Ryugu photographed by the ONC-T on June 24, 2018 at around 00:01 JST. Comment by Project Manager, Yuichi Tsuda. The shape of Ryugu is now revealed. From a distance, Ryugu initially appeared round, then gradually turned into a square before becoming a beautiful shape similar to fluorite [known as the 'firefly stone' in Japanese]. Now, craters are visible, rocks are visible and the geographical features are seen to vary from place to place. This form of Ryugu is scientifically surprising and also poses a few engineering challenges. First of all, the rotation axis of the asteroid is perpendicular to the orbit. This fact increases the degrees of freedom for landing and the rover decent operations. On the other hand, there is a peak in the vicinity of the equator and a number of large craters, which makes the selection of the landing points both interesting and difficult. Globally, the asteroid also has a shape like fluorite (or maybe an abacus bead?). This means we expect the direction of the gravitational force on the wide areas of the asteroid surface to not point directly down. We therefore need a detailed investigation of these properties to formulate our future operation plans. The Project Team is fascinated by the appearance of Ryugu and morale is rising at the prospect of this challenge. Together with all of you, we have become the first eyewitnesses to see asteroid Ryugu. I feel this amazing honor as we proceed with the mission operations. * If you wish to use the images here, please include the displayed credit. In the case where an abbreviated form is necessary, please use "JAXA, University of Tokyo & collaborators". Rosetta Images AWESOME. Downloading IMG files open with NASAView and stretch and truly you're THERE !!! That comet image archive browser is excellent! Bob's selection: Ryugu has a fascinating shape and surface. and morale is rising at the prospect of this challenge. I wonder what the morale problem was all about ? Exceedingly Interesting - Does this mean we can presume a mission? My first thoughts were.... The "Borg"
Watch for other keywords attributed to this object. Besides "enigmatic", words like "fascinating", "intriguing", "anomalous", etc. but can't be openly discussed. Current time: 04-22-2019, 07:55 PM Powered By MyBB, © 2002-2019 MyBB Group.